Who would’ve thought an innocent weekend filler post of photos could cause such a ruckus. People were up in arms about pacifiers here last week. I must thank you all for all the support of Eddie’s beloved “pipey”. This week Sluiter Nation got it’s first glance into the nesting bug that has bit me. It was met with mixed reviews. 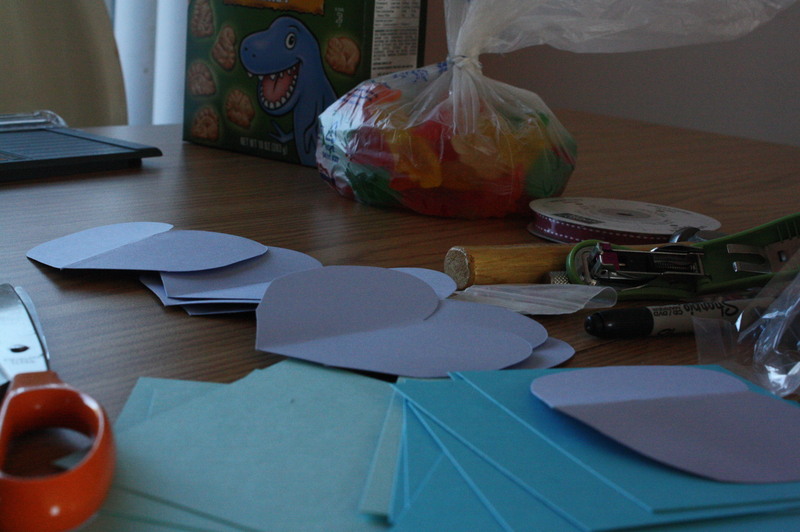 February 13: Sluiters share Valentine's goodies because we don't want to wait until Tuesday night! February 15: Wednesday night treat..."green choc-o-yat i-keem" YUM! February 16: My need to get out the itty bitty clothes takes over all logic that says there is no place to put them yet. February 17: We buy the big boy bed. It is quite well-received. 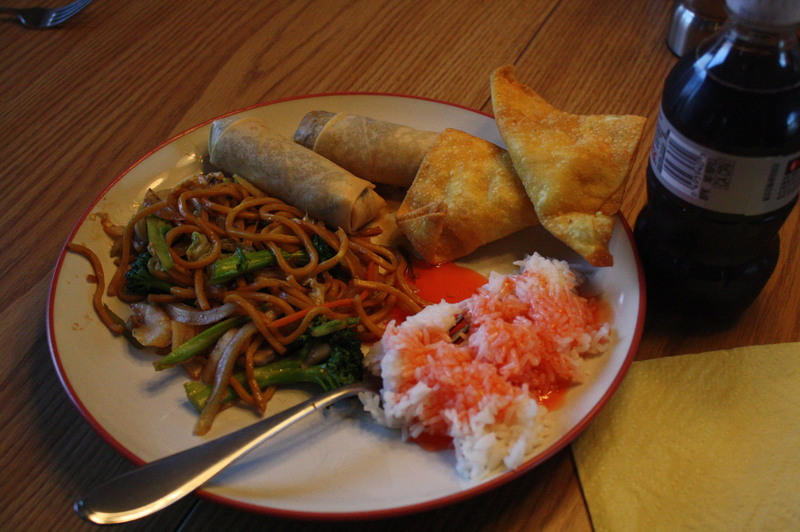 Feburary 18: After a day where I was pretty sure my head would explode, Cort brings home Chinese food. I love that man. There were many battles this week about how Baby Charlie’s things do NOT fit Eddie. About how Eddie is TOO BIG to sit in the bouncy seat. And about how no, that onsie will NOT fit on you, Eddie. There were tears and dysfunctional listening ears. and then asked to sleep in his big boy bed. Even though my heart hurts with these growing pains of his. My first post over at Borderless News and Views: Could You Live Without TV? Well, I missed the uproar about the pacifier, but here’s my (unsolicited) 2 cents. If he’s still using it and is sleeping well? Don’t ruin a good thing. Especially with potty training, bed changes, new sibling coming soon, etc. Too much changes to take away a security item. 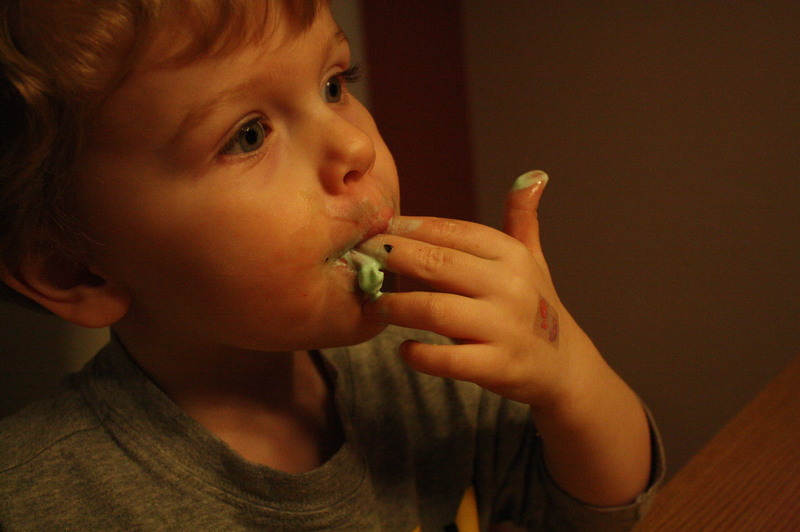 My eldest used his pacifier until he was 4 at bedtime only and it helped him figure life out. I wouldn’t have taken away a teddy bear or blankie, so why a pacifier? I want to make out with that greasy goodness. 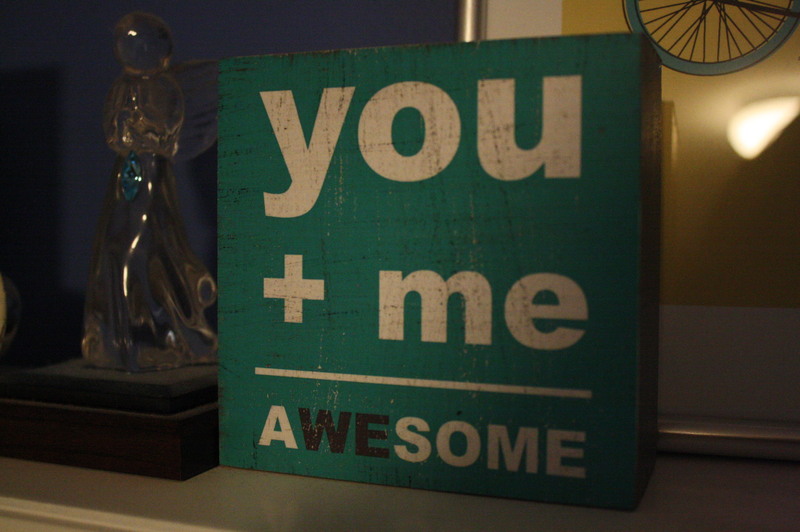 I am in love with the You + Me = aWEsome. I’m dreading potty training with M- we tried last month and failed miserably. I suppose he’s just not ready yet. I’m okay with that for now. I think. We moved M from a toddler bed to a full size bed this week, too. He just looks so tiny in it. Amazing how something like moving into a different sized bed can make such an impact on OUR lives. um. please go find someone else to pick on. Katie sure doesn’t deserve it. someone sound the douche alarm. Yes, you must be new otherwise you would know about Katie’s anxiety and fights with depression. 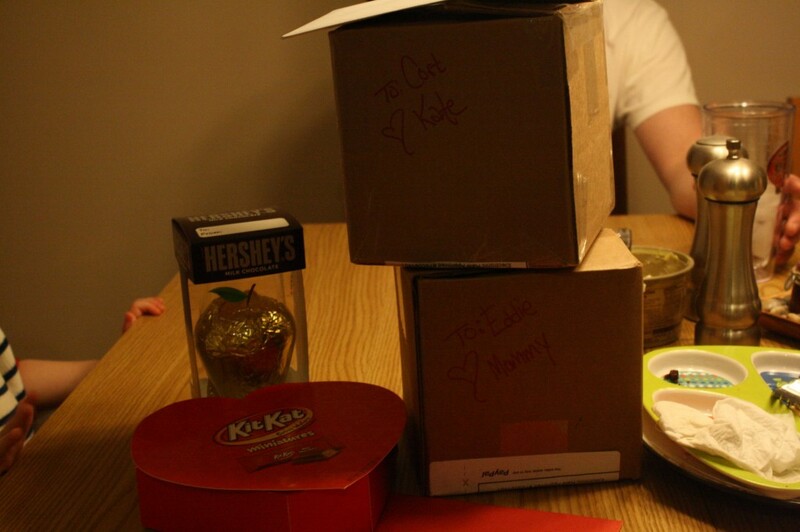 You would know just how much she loves her son and how much time she really DOES spend with him. Get to know someone before you decide to write a comment about this, or else you’ll just end up looking like a bully. Reading an entire blog and making rude, insensitive comments, doesn’t make your comments any less RUDE OR INSENSITIVE. I’m shocked that having dealt with some of the same issues you would say something as callous as “What in the world are you going to do with two kids?” knowing how badly that could hurt. Reading someone’s entire blog doesn’t entitle you to tear them down. Nothing you said was constructive in any way, you just wanted to be mean, don’t pretend it was anything else. I pointed out that I had read the blog because every time someone gives an opinion that others don’t like it’s always said “they must not even read my blog” Yes, I read the blog. That’s why I have those opinions. yes, my husband is pretty wicked awesome, thank you for noticing. and no, I don’t push the parenting on him. Quite the opposite. He is gone most evenings to class or bowling league or whatever, so it’s just me and Eddie. We have good times together. And I don’t tweet when I am doing stuff with Eddie because, well, I am doing stuff with Eddie. Not tweeting. I know you said you went back and read older posts, but I am not sure because there are LOTS of posts about mine and Eddie’s unique bond. About our specialness together. Oh well. I hope you stick around to find out that even though my anxiety is fierce right now at the end of my second pregnancy…it’s not always like this. I can only think that someone would be so hurtful and insensitive out of envy. Katie and Cort are clearly a team and that’s how families should be. I’ve lost count of the number of times my husband has taken the kids out to do something to give me a break. Isn’t that what familes do? I do it for him too. Why would you read the blog of someone you share so muh with and leave a horrid reply like that? Beats me. Find another blog lady and try being nice, maybe then people would be nicer to you. Like Thumper is taught in Bambi, ‘If you can’t say something nice, don’t say anything at all’. WELL SAID, Zoe. This person’s comments make me so upset! Wow, Melanie. Someone must have been really cruel to you when you were growing up. Why else would you be treating people you barely know with such insensitivity? I’m so sorry that you had it rough. I hope that one day someone treats you with kindness so you can experience what it’s like to have friends. And then hopefully you can experience how great it feels to be loving and supportive. Until then, good luck. It must truly be hard to be in your shoes. I think what we have here is the difference between an opinion & an asspinion. that’s my new word of the day. Someone who can stand firm in their convictions — doesn’t leave their opinions anonymously. They would have the courage to show their face. Or are you too scared to leave a link to your own blog so that no one can subject you to the same kind of judgement? Girlfriend…..you need to Sit Down! Can I please have a bite of that egg roll? 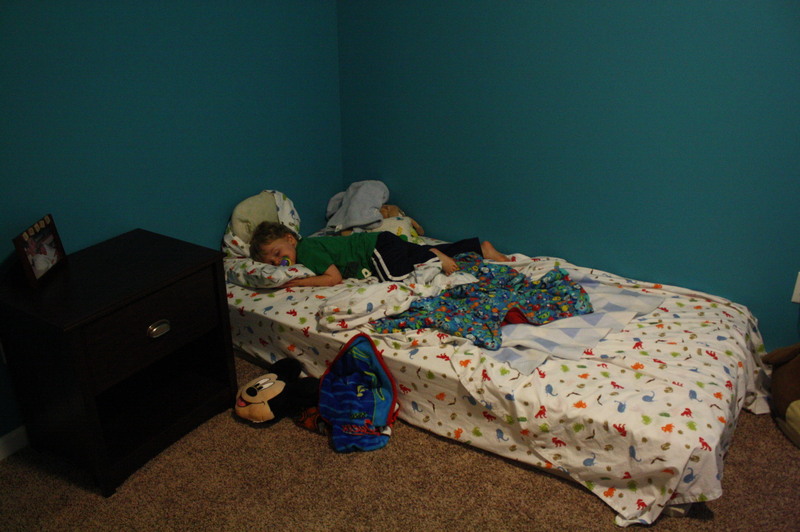 And, I would love to chat offline about the transition to the big boy bed. I’m so happy it went smoothly for Eddie! He looks so cozy. You are doing a great job, girl. I love the photos. And you! They delivered it at 11am and he was happily napping in it by 1pm. So it’s not a surprise at all to me that a well-adjusted wee Eddie hopped right on the big boy bed bandwagon. Yay, Eddie. And hang in there, Mama. We’re all out here pulling for all kinds of smooth transitions! It’s sad that someone has to come and bring all types of negativity. What gives someone the entitlement to judge based on “twitter and blog for a couple weeks” or whatever is beyond me. The lack of sensitivity is pathetic and rude. Anyone who has suffered through ppd/ppa knows that it can be an ongoing battle at different stages with different triggers for everyone. Move it on down the road or unfollow lady. This is a community. Glad he likes the new bed! FWIW, my son was 2 when daughter was born. 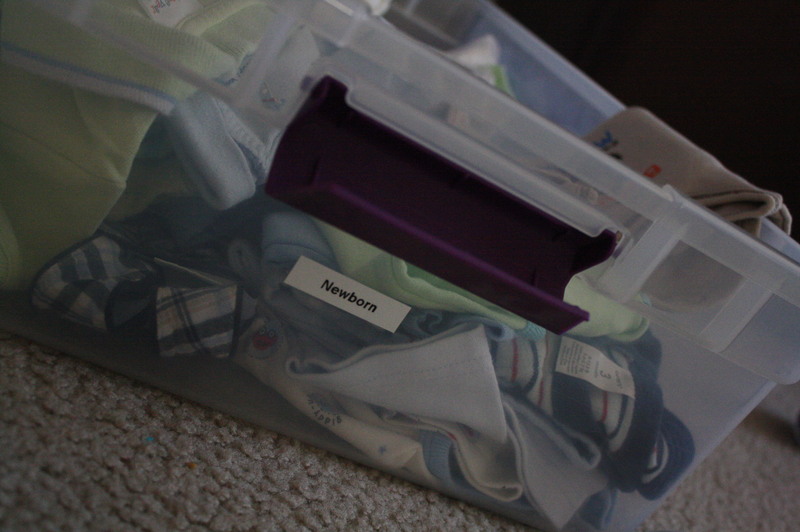 A month or so beforehand we got out all the baby stuff (swing, bouncy, baby car seat etc). This gave him plenty of time to play with those things so by the time she arrived and actually used them he had completely lost interest. I also let him try the different things to discover for himself how he was too big for them. He would get in the swing, climb into the pack n play etc. I did that with exersaucer, riding toys, push toys, high chair etc..got them out before she would need them so he could get his fill of them. Oh my gosh, transitions are so hard, for everyone! Hang in there honey. So many of us have been there too and can TOTALLY relate. Be gentle with yourself and surround yourself with the knowledge that you are loved. Apparently, you are hurting, and for that, I’m truly sorry. I hope and pray that you will find the strength to seek help for whatever is making you miserable. It seems that writing hurtful and untrue comments must make you feel better about yourself. There must be something bothering you, or you wouldn’t intentionally hurt others. Being genuinely kind to others is extremely helpful and rewarding. It’s easier to be kind, than to be judgemental or make someone feel miserable. Why do you want to hurt others? Again, be kind. I hope you will consider this unsolicited advice. The evils of having a blog include exposing ourselves to great criticism. It is clear, though, that when we do blog we only share parts of ourselves, not all. And Twitter? Seriously? That’s the place to b*tch, tweet nonsense, etc. I love Twitter for many reasons, but because I can just put stuff out into the universe. As a fellow PPD sufferer, God bless my husband. Who is this man that deals with my ridiculous mood swings? And allows me to sit upstairs and pout like a 2 year old when my kid is being a turd? Who hates staying in the house, but lays around on the weekends anyway cause he knows in my depressive state I don’t really want to go anywhere? Marriages are partnerships. You & Cort are a team and seemingly damn good at it.